Amazon Handmade was launched in October 2015, exactly two years ago. It is a category inside of Amazon.com (and since then UK, and now Canada too) offering handmade products, with some unique design changes to better fit the different nature of those products. It was hailed as the “Etsy killer” since it focuses on one of the core categories of the Etsy marketplace, though it hasn’t succeed in doing so yet. Amazon Handmade currently has just over 900,000 products listed, up from 80,000 when it launched two years ago. 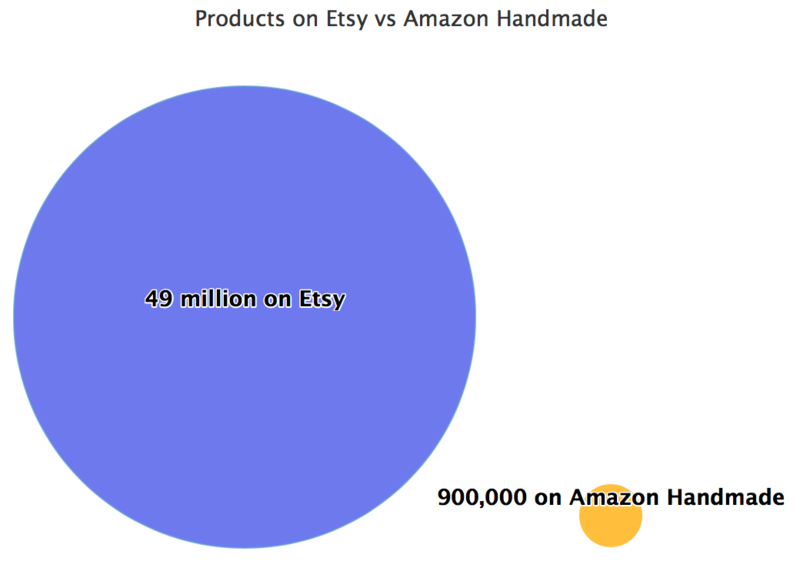 Compared to Etsy’s catalog of 49 million products. Both of those marketplaces have plenty of sellers stretching the definition of handmade beyond what most would expect it to be though. Pressure from investors has forced Etsy to redefine what handmade stands for a few times, and thus external help is now permitted. On Amazon too some of the products offered are not strictly handmade. Etsy doesn’t stop at handmade though, as it also has vintage, and craft supplies products. However most sellers, and thus most sales, are in the handmade category. In the meantime Amazon has been expanding the handmade category by adding additional subcategories. It now includes Handbags & Accessories, Baby, Beauty & Grooming, Home & Kitchen, Jewelry, Pet Supplies, Shoes, Sporting Goods, Toys & Games, Stationery & Party Supplies, and Clothing. The products on Amazon Handmade are listed by 13,547 sellers based on our research. 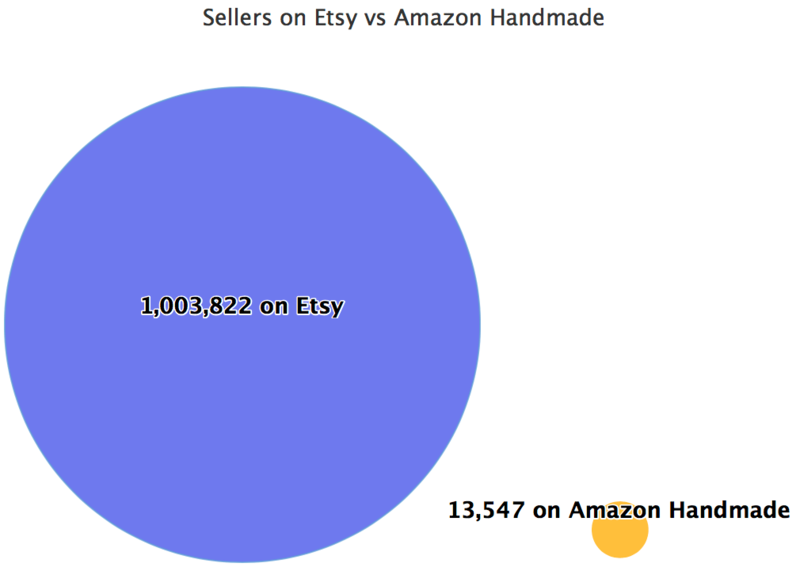 Compared to 1,003,822 sellers with products listed on Etsy. Etsy uses the number of active sellers metric which tracks how many sellers sold at least one product in 12 months. It was 1.83 million in 2017 Q2. But many of those sellers only appear periodically, that’s why 1 million sellers currently have products listed for sale. If all Amazon Handmade sellers were one seller, the number of seller feedback reviews received by it would make that seller the number one seller on Amazon.com marketplace. However some handmade sellers do sell in other categories too. Etsy is going to finish the year for the first time surpassing $3 billion in merchandise sold. Amazon does not release sales figures by category, but given the seller feedback reviews total mentioned above Amazon Handmade is likely a $300 million category, plus or minus $100 million. This week Amazon launched the Handmade Gift Shop, a curated selection of products from the handmade category. This announcement caused Etsy stock price to fall a few percent points, exaggerating what realistically was simply a few changes to the website user experience. The key message here is that it is not about the type of product, it’s about the reason people look for that type of product. Both Etsy and Amazon Handmade are suggesting that handmade products are often bought for an occasion. A big part of buying handmade items is the browsing experience, and discovery of products appealing to a customer. It is not as straightforward as picking the featured or best ranked product like most purchases on Amazon are. This different type of shopping has yet to be tackled by Amazon. The Handmade Gift Shop is one of the attempts to fix that, as the handmade page with a million products, and a search bar - an experience of handmade before - is not fit for this category. Etsy has been struggling to grow over the past few years, but not because of actions taken by Amazon. Our research shows that it continues to be the market leader in its category, both in terms of sellers, products offered, and by induction sales too. And it being a focused marketplace on a niche category is a strong card, with Amazon only being able to make moves because of their already massive reach.